The Group of Thirty releases its latest report on corporate governance and culture in global financial institutions. Today, we are proposing comprehensive reforms in the approaches to bank culture and conduct that are both essential and urgent. Despite progress being made in strengthening their cultures, a number of the world’s largest banks are still failing to implement needed cultural and conduct reforms in their businesses, states the Group of Thirty (G30) today. The Group of Thirty, a forum of leaders in international finance, called today for far-reaching banking reforms to restore public trust. It said many banks still need to implement reforms to address the ways bankers are paid, dismissal if necessary of bankers, including top executives, new approaches to hiring, and stronger roles by boards of directors to ensure cultural and conduct changes. 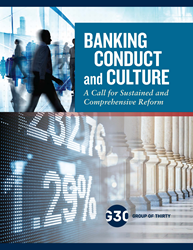 The report, Banking Conduct and Culture: A Call for Sustained and Comprehensive Reform, states failure by banks to move ahead across-the-board cultural and conduct reforms could lead to still more regulatory rules and actions. The study was led by a G30 steering committee co-chaired by Roger W. Ferguson, Jr. and William R. Rhodes, with Gerd Häusler, John G. Heimann, and Sir David Walker serving as vice-chairs. Culture and conduct in this context is the mechanism that delivers the values and behaviors that shape conduct and contribute to creating trust in banks and a positive reputation for banks among employees, the investor community, and the wider public. The report noted that numerous conduct-related problems included market rigging in traded markets, selling of structured and bundled products to unsophisticated wholesale and retail clients, and high-profile anti-money laundering violations. The G30 recommends a series of comprehensive reforms aimed at implementing effective approaches to embedding ethical employee values and conduct within banks. Specific proposals include significant sanctions on pay for wrong-doing; protection of whistleblowers who report alleged workplace wrong-doing; far greater attention to values, culture, and conduct, in recruitment, staff training; a ‘balanced scorecard’ approach to appraisals that includes performance and cultural measures; and a strengthening of boards of directors and/or supervisory boards to better monitor and influence the bank’s culture, including greater board diversity in terms of both gender and professional experience. The G30 urges banks’ leaderships to challenge the conventional wisdom on legal impediments, barriers that often lead to too little being done in the case of serious breaches of cultural norms. Actions should encompass pay cuts, the dismissal of staff, including, if necessary, senior managers. All of this demands far greater engagement and monitoring of cultural outcomes by boards of directors. The report’s recommendations reflect both the failings found in many banks and the best practices that some banks are deploying today. Among the major failures, the G30 found: a lack of sufficient focus and engagement from boards; inconsistent leadership by senior managers; relatively small cuts to CEO and executive team compensation when faced with persistent conduct and values problems or failures in the firms; even when there is a good tone from the top, it is often the case that the majority of middle management fail to adequately take cultural and conduct matters into account and often revert to traditional performance criteria (such as revenues, profits, return on equity); and, there is often a lack of progress in improving culture and values due to entrenched behaviors and an insufficient buy-in on conduct and values initiatives. The G30 concludes that new rules and regulations are not the answer to fixing bank culture. It does not believe that matters of corporate culture can be imposed by official regulatory authorities. Rather, the G30 proposes a deeper engagement, involving expert exchanges of views between supervisors and CEOs and boards and effective monitoring of progress in this area. It states that this will assist the cultural repair that is needed, while recognizing that culture and conduct must be led by the banks themselves. The report is based on nearly 80 interviews in 16 countries with central bankers and senior supervisors, bank board chairs and members, CEOs, and senior managers. Davide Taliente, a Managing Partner at Oliver Wyman, was Project Director for this study. For more on the G30 and to download today’s report please go to http://www.group30.org.